HIsmelt is short for high intensity smelting. It is a direct smelting process for making liquid iron straight from the iron ore. The process has been developed to treat iron ore fines with minimum pretreatment, making the process more flexible in terms of the quality of iron ore it can treat. The process allows the use of non coking coal and iron ore fines with significant impurities. 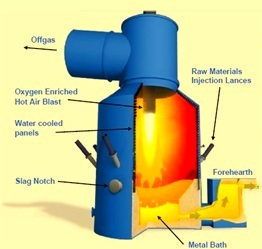 The core of the HIsmelt process is the smelt reduction vessel (SRV) which has a refractory lined hearth and water cooled upper shell. The process is carried out in this vessel. The refractory hearth contains the molten iron bath and liquid slag. The main product of the process is liquid iron or hot metal which can be used in steel melting shop or cast in pig casting machine to produce pig iron. The byproduct of the process is slag and the off gas. HIsmelt process has the following unique features. The method of solid injections using high speed lances ensure that the capture efficiency in the melt is high and even ultra fines can be used directly. The ‘natural’ 5 % to 6 % FeO level in the slag in conjunction with the metal carbon at 4 % creates conditions for strong partition of phosphorus from metal to slag. Typically around 80 % to 90 % of phosphorus goes to slag. Coal performance has virtually no dependence on particle morphology, since the coal is ground fine for injection. The origin of the HIsmelt process is traced back to the bottom blown oxygen converter process (OBM) and the evolution of the combined blowing steel making process developed by Klöckner Werke at their Maxhütte steel works. CRA (now Rio Tinto) formed a joint venture in 1981 with Klöckner Werke to pursue the steel making and smelting reduction technologies. Trials were conducted in a 60 tons OBM converter to demonstrate the fundamentals of the smelt reduction process. The successful testing of the smelt reduction concept led to a small scale pilot plant (SSPP) of capacity around 12000 tons per annum located at the Maxhütte steel works. The design of the SSPP was based on a horizontal rotating SRV that used bottom tuyeres for injection of coal, fluxes and iron ore. The SSPP operated from 1984 to 1990 and proved the viability of the technology. Next stage of the process development was the HIsmelt Research and Development Facility (HRDF) constructed at Kwinana, Western Australia. Construction of the HRDF with a design capacity of 100,000 tons per annum, commenced in 1991. The main objective of the HRDF was to demonstrate the process and engineering scale up of the core plant and to provide operating data for commercial evaluation. The original SRV configuration for Kwinana was a direct scale up of the SRV of SSPP and was based on a horizontally shaped vessel capable of rotation through 90 deg. The horizontal vessel was operated from October 1993 to August 1996. Whilst scale-up of the process was successfully demonstrated, the complexity of engineering a horizontal vessel limited its commercial viability. To overcome this deficiency a design was developed for water cooled vertical vessel. Design and engineering for the vertical SRV (Fig 1) was completed in 1996. The main improvements incorporated into the design included a stationary vertical vessel, top injection of solids, a simplified hot air blast lance, a fore hearth for continuous tapping of metal and water cooled panels to overcome refractory wear problems. HRDF vertical smelt reduction vessel was commissioned in the first half of 1997 and operated through to May 1999. The vertical vessel demonstrated major improvements in terms of refractory wear, reliability, availability, productivity and simplicity in design. This vessel addressed all the key requirements for a successful direct smelting iron making technology – combining a high level of technical achievements with simple engineering concepts and plant technology. This stage of operation confirmed that the process was ready to be scaled up to level of a commercial plant. A joint venture was formed in 2002 between the Rio Tinto (60%), Nucor Corporation (25%), Mitsubishi Corporation (10%), and Shougang Corporation (5%) for the purpose of constructing and operating an 800,000 tons per annum HIsmelt plant. Located in Kwinana, Western Australia, the merchant pig iron facility was designed and engineered with a 6 meter hearth diameter SRV. Construction of the plant was started in January 2003. Cold commissioning commenced in the second half of 2004 while the hot commissioning was carried out in second quarter 2005. The plant had achieved a production rate of 80 tons of hot metal per hour in early 2008 with a coal rate of 810 kg per ton of hot metal. The plant is presently in the closed down condition. To develop the HIsmelt technology further, Rio Tinto has signed a development agreement with a Chinese steelmaker. This involves relocating some HIsmelt plant equipment from Australia to a new HIsmelt facility to be built in China. The new plant is expected to be commissioned in 2014. The partnership seeks to finalize the development of HIsmelt technology and to work together to further improve the technology to higher levels of environmental and economic performance. The basic mechanism of the process is the reduction and smelting of the iron bearing ores with the dissolved carbon in the bath. The process uses high velocity injection of coal and ore into the melt through downwardly angled water cooled injection lances. Injected coal after heating and devolatilization dissolves to maintain around 4 % carbon in the molten metal and replenish the carbon used in the reduction reaction. Injected iron ore fines are injected deep into the bath where they are reduced instantly on contact with carbon dissolved in the bath for smelting to take place. This reduction reaction produces iron (Fe) and carbon monoxide (CO). The lower part of the SRV is maintained at low oxygen potential to allow this reduction reaction to occur and the reaction kinetics balance out at around 5 % to 6 % of FeO in the slag. Reaction gas (CO) and coal devolatilization products which are generated from deep within the bath form a fountain of mostly slag and some metal. Heat supply to maintain the necessary thermal balance comes by the combustion of reaction gas (mostly CO) in the upper part of the SRV. Oxygen enriched (typically 35 %) hot blast at 1,200 deg C is introduced through a top lance and efficiently burns the gases generated within the bath and releases large amounts of energy. This combustion occurs in the relatively oxidizing region in the upper section of the SRV. The heat transfer between the upper (oxidizing) regions to the lower (reducing) region is achieved in such a way that the oxygen potential gradient is maintained. This is done through large amounts of liquid splash moving between the two regions. Liquid slag and metal splash acts as a carrier of the heat. Since the slag is batch tapped through a slag notch, the hot metal is slag free. The hot metal can be treated in a hot metal desulphurization plant to bring down the sulphur level of the hot metal to less than 0.05 %. Byproducts of the process are slag and off gas. Slag is formed by fluxing the gangue in the iron ore and ash in the coal with lime and dolomite. Slag can be granulated or directed into pits for further processing. It can then be used as a raw material for a variety of purposes such as cement manufacture, road base and soil conditioning. Off gas from the process typically has a post combustion degree of 50 % to 60 %. They exit from the top of the SRV at high temperatures and have energy values similar to BF gas. It is cleaned, cooled and used as a fuel and for power generation. HIsmelt process is highly flexible. The highly responsive nature of the process means that it converts iron ore, coal and flux to metal, slag and energy almost instantaneously. These process capabilities allow for raw material feed rates to be changed very efficiently without affecting product quality. This operating flexibility maximizes productivity, as it is easy to maintain a steady state operating window. Unlike blast furnaces, the HIsmelt process can be started, stopped or idled with ease. Typical flow sheet of the process is shown in Fig 2 and the typical layout of the process is in Fig 3. The environmental benefits of the HIsmelt process are considerable. By reducing the demand for coke, sinter and pellets, and improving the energy efficiency of the iron making process, it reduces emissions of greenhouse gases and other damaging environmental pollutants such as SOx, NOx and dioxins. The projected improvements from the process are as follows. No toxic emissions. Brings emissions of dioxins and furans to a nil level. Further there is big reduction in dust emissions and specific wate consuption. The process by recycling of the plant waste further helps in environment protection. Low cost raw materials – ferrous feed agglomeration and coke making processes are eliminated. Flexible feed stocks – the process operates on a wide range of iron ore fines and waste oxide materials, together with high and low volatile coals. Very valuable information sir. Thank You Sr. 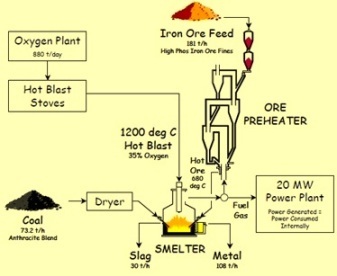 Blast furnace process is no doubt proven route globally. Any other technology to reach the level of BF will take a lot of time. But some iron making technologies like finex, HIsmelt and HIsarna are technologically sound and have potential to have better techno-economics. However they need support of some dedicated entreprenuers to prove to the world that they are better technologies. Once there are 2-3 successful operating references available for these technologies then all the future installations will be of these technology based iron making units. If BF is present then these technologies are the future.